Find out where your puppy got its start by taking a look at our facility and learning a bit more about our breeding program. We have been breeding quality dogs for over 20 years. Our puppies are AKC straight-back German Shepherds bred for pets, protection and police work. 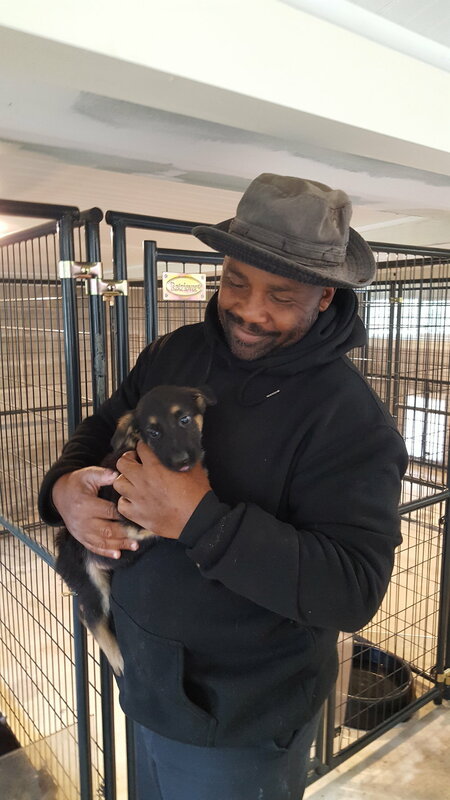 We take great pride in carefully selecting outstanding AKC-registered German Shepherds for our breeding program based on their temperament, intelligence and trainability. These are the attributes that create a dog you can trust with your life and the lives of those you care most about - the traits that make a dog truly a Trusted Guardian. Our facility is located in Pomona Park, Florida, about an hour and 10 minutes south of Jacksonville and an hour and a half northwest of Orlando. We are centrally located, and within an hour and a half drive of several major airports. We are a small breeder, with just three breeding females: Jett, Abbey and Lakota. Our stud dog, Rex, lives here as well. We treat our dogs as pets, and while we have a kennel, our dogs are never “warehoused” in cages. They are either in the house with us, or playing in our yard. We have 30 acres here, so there is plenty of room. We also have a barn and several pastures with goats, horses, peacocks, guinea pigs and cows. Our breeding facility is on our property adjacent to our home. Our property is “out in the country” and it is fenced and cross fenced. Our breeding facility has its own fence around a 50’ x 50’ parcel that is dedicated strictly to the kennel. We built our kennel to AKC specifications in terms of run sizes, cleaning options (i.e., with a cleaning trough), and eight windows for a lot of natural light. It has a concrete floor that can be bleached, mopped or pressure washed. The kennel is heated and air conditioned. There is a full kitchen with sink, refrigerator, dishwasher, professional grooming tub and table, and a washer/dryer. There are eight windows and two doors as well as one dog door with a guillotine closure so we can control when dogs are allowed to let themselves in and out. The dog door leads to the 50’ x 50’ dog yard which is fenced with chain-link. The yard has a carport with a concrete slab floor so dogs and puppies that are playing outdoors can be in the sun or shade, or get out of the rain should a Florida shower come up unexpectedly. That dog yard is dedicated to moms and puppies. We have other fenced areas where adult dogs can run and play that are much larger. We have two dog runs in the outdoor dog yard on a concrete slab – half under the carport and half in the sunshine – where young puppies get their first outdoor experiences. As they grow, they are turned out into the 50’ x 50’ dog yard to play. 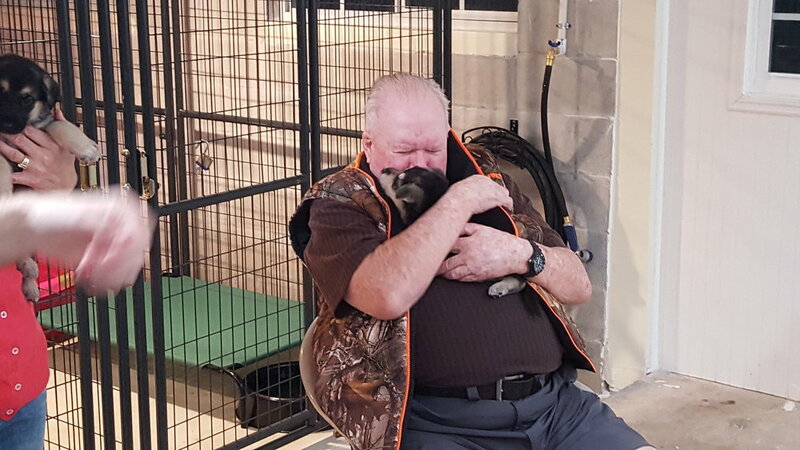 We only allow prospective families to visit after puppies are four weeks or older, and when they come, we ask them to step into a plastic container with a very thin layer of bleach water to kill any potential germs on the soles of their shoes before entering our facility. We also ask them to wash their hands before handling the puppies – all very important steps to help protect young puppies’ immature immune systems. There are two doors into our facility. And as you can see, there is lots of natural light. There are eight windows and both doors have a window insert as well. Each of the windows opens and has screens in place so we can have good airflow. In this photo, you can see that there is a dishwasher on the left that we use to clean our dog and puppy bowls. Here is the sink area where we prepare our dogs’ and puppies’ meals, administer medications and take notes on each puppy’s weight for the first month or so of their lives. At the left bottom of the counter, you will see a refrigerator/freezer. We often mix soft food in with the dry food and have partial cans we need to store until the next feeding. You can also see our grooming tub and our washer and dryer for washing grooming towels and bedding as needed. You can also see the second door that leads out to the carport/fenced dog yard. Our dog runs are convertible. The way they are pictured here is as 5’ wide x 15’ long. They can, however, be reconfigured into any size – from one large pen to four individual pens. The last run here on the right has a covered flap dog door that leads to the fenced 50’ x 50’ dog yard. The dog door also has a guillotine cover so we can lock our dogs in during inclement weather or when they need to stay indoors with their puppies. You can see the that dog runs are a step down from the rest of the room. That is so that we can hose them out or pressure wash them without getting the entire room wet. We hose/pressure wash every day, multiple times a day (following each of the puppies’ puppy food feedings). Inside each run, you will see a plastic children’s wading pool. This is what we use as a whelping box. It is more sanitary and can be pressure washed and thoroughly cleaned, whereas a wooden whelping box cannot. Here are some pictures taken just shortly after Jett had whelped her first litter. You can see how easy the cleanup was by looking at how nice and clean the pool is just after the pups had been born. When the puppies are very young, we also use a heating pad made for puppies (not the human kind which can get too warm) to help them regulate their body temperatures. In the photos, the black mat is the heating pad. Our kennel is heated and air conditioned too, and we keep it at a temperature that is comfortable for humans and pets. We also believe in lots of fresh air, weather permitting, and all eight of our windows can be opened on warm days and nights and have screens to keep the bugs out. Food bowls are picked up as soon as each meal is over, washed and dried, and set out on the counter for the next feeding. To the right, you can see syringes for de-worming. We de-worm our puppies at two, four, six and eight weeks in cooperation with our vet who provides us with the right dosages of de-wormer. At eight weeks, we take our pups to the vet for a thorough examination and their first set of puppy shots. We offer a one-year health guarantee. And we also state in our contract that we will take the puppy back at any time in its life – no questions asked – if the owner cannot keep it. This prevents any of our puppies from ever ending up in a pound. Now, let’s walk outside into the dog yard. It is about 50’ x 50’ fenced with chain-link. As you can see, there is a covered carport area with a concrete floor just outside the door. This gives dogs and puppies shade on hot days and a dry place to be if a shower pops up. There are two dog runs on this concrete slab just outside the kennel door. When pups are about four weeks old, they get to spend a few hours a day outside in these dog runs. Mother dogs are turned loose in the dog yard so they can see their pups, but they get some much-needed rest from being pounced and chewed on! Moms are put into these runs for a little while several time during this outside time so they can still nurse pups as they wean them. Here is the dog yard. The tree provides shade. And this is in a central location, near our house and (as you can see in the distance) near our playground equipment. While young puppies have their playtime in the outdoor dog runs, older puppies are turned out into the yard to exercise as well. The puppies are fed three times a day; the first feeding is indoors in the mornings. Then they move outside to the outdoor dog runs. When they go outside in the mornings, we clean the indoor runs so they are clean and dry when the pups come back inside in the evening. After the puppies go back indoors, we pressure wash the outside runs so they’re ready for the next morning. Thankfully, we have two fabulous helpers who each work here part-time to keep the grounds beautiful, the yard free of dog feces, and to keep the kennel clean. They also help with whelping and dog grooming, training and vet visits. And when they are not here, our whole family (see my husband pictured above) pitches in to get the job done. We have to say a special “thank you” to our helpers! Brian (left) and Don (right) make sure our kennel and property always look their best! We couldn’t do it without them both! 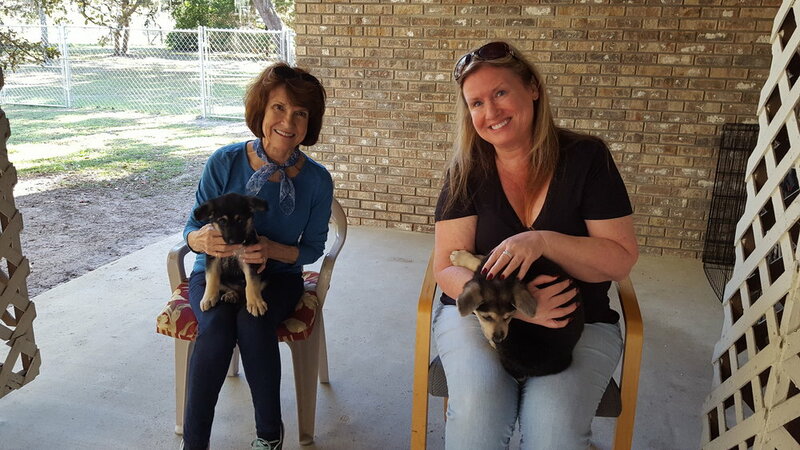 In addition to the paid help, when we have puppies here, we enlist the help of our friends and family to come socialize the puppies. We want them to be familiar and comfortable with people of all ages from Gramma (who lives here) and friends her age to our children and their friends ages 15 to 21. Our family all handle and play with the puppies every day multiple times a day. And we introduce them to new sights, smells and sounds as often as possible (i.e., cats, vacuums/pressure washers, kids playing, etc.) so that they will be happy, well-adjusted puppies when they leave us for their new homes.